30 families were provided with Thanksgivign turkeys and Acme gift cards to assist them in their Holiday meal preparation. 4 families in need were "adopted" by the foundation and provided with Christmas gift cards and clothing gift cards. 10 families were assisted with medical bills and household expenses in addition to contributions made to Go-Fund-Me campaigns. Left is Goodwill CEO Colleen Morrone, Gilda & Bill Mock along with Yolanda Medina, Goodwill Graduate of the Year and recipient of a Billy Mock Foundation Families in need grant & Cheryl Wiechecki-Casino from Goodwill who was the contact between BMF and Goodwill and was Yolanda’s life coach. Assisted 10 individuals and their families experiencing personal and financial hardship. Some of the ways we helped: grants to secure housing for three individuals; financial assistance for household expenses to 8 of our recipients; financial help with personal and healthcare related costs; holiday turkeys and Acme gift cards were presented to 5 families; 20 children’s winter coats were donated to Goodwill of Delaware and Delaware County, Inc. A total of 12 Educational grants were awarded this year. Two needs-based and Nine community service-based grants were awarded to students from the following elementary schools: St. Joseph’s School, Downingtown; St. Thomas the Apostle School, Glen Mills; St. Francis DeSales School, Lenni; Blessed Virgin Mary School, Darby; St. Agnes School in West Chester; Notre Dame DeLourdes School, Swarthmore; Holy Family Regional School, Aston. One Institutional Grant was awarded to Drexel-Neumann Academy in Chester. The BMF has supported the Drexel -Neumann Academy for many years. Delaware County 30 hour Famine. -Joy of Sox – Annual youth project of collecting socks for the homeless. -Teddy Bear project by St Thomas’ Billy’s Buddies. -Judi Marvel Charities – helping smaller local charities. -Knights of Columbus- supported local fundraising. The Billy Mock Foundation Kids Club is the latest development in an organization which has always remained true to its core principles simple “to help others”. When younger students at St. Thomas the Apostle (Billy’s former school) in Glen Mills, PA heard about the activities the adults and high school kids have been organizing for Foundation fundraising and community outreach, they asked to help. In fact, so many were interested, that meetings were packed with 70+ students from K thru 8th grade. Each month Billy’s Kids work on an activity which is age appropriate for grade school children and has a particular service theme. Past projects include soliciting donations of household items and packaging them with homemade cards for a local family whose house was destroyed by fire. Crafts were made during Autism Awareness Week all sales were donated to Autism research. The Club has been a wonderful way for kids at very young ages to see service to others to be active in their community as a part of their daily lives. – Fundraising efforts allowed us to reach out to 11 families in our community. As in past years, we were able to assist families through their financial hardships. We contributed to medical fundraising events, helped to pay off outstanding household bills, provided gift cards so our families could purchase necessary medicines and food for their families and gas for their travelling expenses. We also provided two families with Christmas turkeys and food gift cards to complete their holiday meal. In 2014, the Billy Mock Foundation awarded 10 educational grants totalling $7,000. Nine educational grants were awarded to local 8th grade students: seven awards were given in recognition of the students’ commitment to “Simply Helping Others” in their communities, and two “needs-based” grants were awarded to local students and their families. An institutional grant was again awarded to Drexel-Neumann Academy who support our mission of “Simply Helping Others” by providing a quality education in a safe and nurturing environment for children of the city of Chester, as an alternative to the crime and violence the students would witness in the failing schools of the district of Chester-Upland. (left) Pay It Forward program sponsored a Special Olympics project for this year. The Foundation sponsored team jerseys for the inaugural Delco Dragons Flag Football Team. 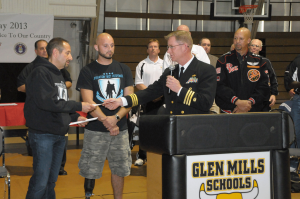 (See logo on right shoulder) Board member and athletic director at Glen Mills School, Pete Forjohn was one of the coaches. June 2013, The Billy Mock Foundation awarded 10 educational grants totaling $6400. Nine of these needs-based and “Simply Helping Others” awards were presented to individual eighth grade students at area schools , including St. Thomas the Apostle in Glen Mills, St. Joseph’s in Downingtown and Holy Family in Aston. An additional institutional grant was awarded to Drexel Neumann Academy in Chester, in recognition of their ongoing commitment to the educational and spiritual needs of the “at-risk” students of their school. This year alone, Families in need assisted 13 local families experiencing medical and personal crisis by contributing to medical fundraisers and providing gift cards for food, groceries and gas. Additionally we facilitated payment of miscellaneous household expenses and provided model train sets at Christmas to 3 of our families with younger children. During 2013 the Pay it Forward of the BMF provided grants to the following programs. Operation Warm Coat – provided funds to purchase coats distributed throughout the Delaware Valley to children in need. • Style Me Hired – provided funds to a local woman affected by the Sandy Hurricane. • J Foundation – grant to support many families who have children nearing the end of their life due to terminal illness. They try to ease some of the financial burden that arises when a child becomes seriously ill and/or passes away. • Contributed monies to a local foundation that provides food for the homeless at Philadelphia & Delaware Soup Kitchens. • Caring Cupcake Program – supplied homemade cupcakes for birthdays of children living in a local women’s shelter. Each time there is a birthday 60 cupcakes & 1 special cupcake for the birthday child is provided. • Elam United Methodist Church / Youth & Family Ministries – provide monies to assist buying food during the 30 Hour Famine weekend of February 23 & 24, 2013. • Kelly’s Heroes Team – sponsored a grant for Tommy’s Run team that participated in the Crohn’s & Colitis’s Run. Program, will be matching that amount by purchasing another 1,742 pairs of new socks to be donated to the ” Joy of Sox” organization. This is the third year of this wonderful partnership. In three years The Billy Mock Foundation and St. Thomas the Apostle School have partnered to donate over 10,000 pairs of new socks to this wonderful organization that provides a much needed service to the homeless. We would like to thank all of the students, teachers and staff at the school for their continued support. A special thanks to teacher Amy Mills for helping to coordinate the project. ( From left to right) are: Teacher, Amy Mills; Student, Deanna Latini; Tom Costello, Founder “Joy of Sox”; Rita Forjohn, Billy Mock Foundation, Pay It Forward Committee; Students Tori Mock and Lizzie Rush. BMF donated money to Boy Scouts Troop 154 for their community service trailer. The BMF partnered with a local youth group based out of Elam Church in Glen Mills, Pa. The group has partnered with 5 other area youth groups to participate in World Visions 30 hour Famine to help raise awareness about the hunger problem that is so prevalent in our country and the world. We have provided monies to assist in buying food for the homeless during their 30 hour program scheduled for the weekend of February 24, 2012. ( There were about 30 students involved and they probably distributed 100 or more meals = 130) In July 2012, we partnered with the youth group to a trip to Lewiston/Auburn, Maine. This region declined in the 1980’s with the closing of many manufacturing plants, while buildings became vacant. There they served in several different services: Kids Club, work projects including painting houses, home repairs, cleaning up debris, volunteering in community projects. These services took place at Children’s Programs, Elderly Centers, Soup Kitchens & Homeless shelters. The Families in Need committee has reached more than 40 families since our inception. And we continue to assist more individuals and their families as we receive requests for help. We have been working with people who have suffered great losses of personal property, health and life. Some of these individuals you may know about since a few have been newsworthy. We are providing assistance with household bills such as mortgage payments, phone and electric costs, contributing to medical fundraisers and offering food and gas gift cards. Our hope is to help alleviate some of the financial burdens imposed on families during these personal trials. The Billy Mock Foundation awarded individual BMF educational grants this year to 3 students from St Thomas the Apostle, 1 from Holy Saviour/St. John Fisher, and 1 from St. Cornelius. Additionally, an institutional BMF Educational Grant was awarded to Drexel-Neumann Academy in Chester in support of their newly established Virtual 10th Grade Program. “What a wonderful blessing! We are so grateful for your continued support and faithfulness. This generous grant will have such a significant impact on our virtual ninth and tenth (!) grade program. Without the support of wonderful people like all of you, the children of Chester would be very limited for their educational options. As you can imagine, some of our students require extra assistance and because of you we are able to meet their needs. We have a very special place in our hearts and prayers for the Billy Mock Foundation and most importantly to Billy, who lived a life which has touched the lives of so many children in the city of Chester! Easter Baskets to A.I. duPont hospital. This is the second year The Billy Mock Foundation has partnered with A.I. 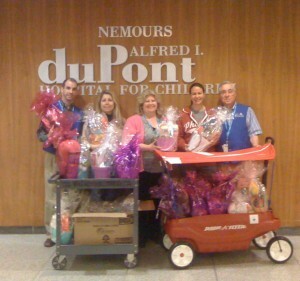 Dupont to bring Easter baskets to children in the hospital. A special thanks goes out to Board member Roe Falcone and her Staff at EDSI Solutions who put together the baskets again this year. BYC Spirit Thank you to Billy Mock Foundation Thank you letter from BYC Spirit Cheerleaders. This is an organization started by Emily Uniacke while she was in high school at BYC (www.brandywineyouthclub.com). The Spirit squad is made of special needs cheerleaders and volunteer coaches. Here is a article about the program. Thank you letter from Joe Foxwood, Youth and Family Ministries Coordinator, Elam United Methodist Church. The Joy of Sox is a local charity that collects new socks to be distributed to the homeless. Go to: http://thejoyofsox.org/ to learn more about this wonderful charity. This winter the students at St.Thomas donated 2,169 pairs of new socks. That number will be matched by the Billy Mock Foundation for a total of 4,338 pairs of socks to be distributed to the homeless in our area. The Foundation made a grant to the BYC Spirit Cheerleaders. This is an organization started by Emily Uniacke while she was in high school. Emily was one the guest speakers at this year’s Golf Outing. Emily founded the Spirit Cheerleaders within the cheer leading program at BYC (www.brandywineyouthclub.com). 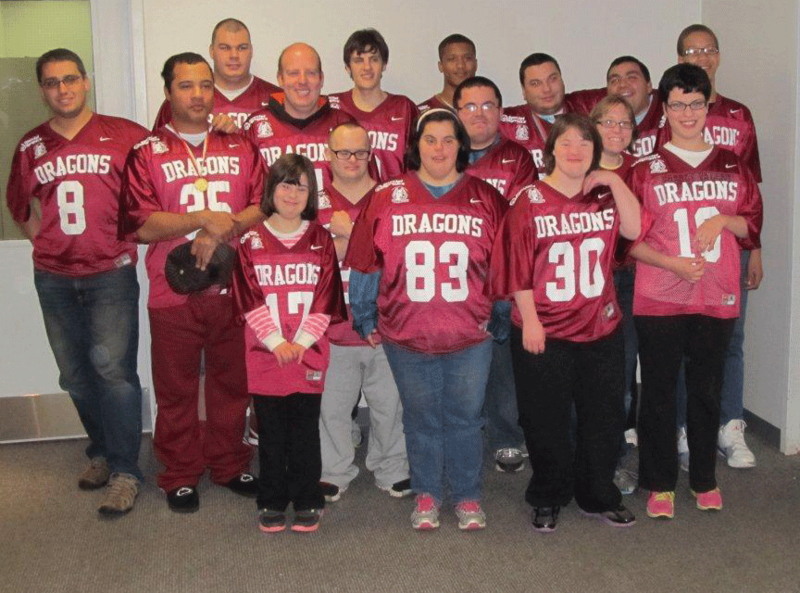 The Spirit squad is made of special needs cheerleaders and volunteer coaches. Here is a article about the program. She spoke about starting this program and its impact on the children involved and how the Billy Mock Foundation Grant was used. ……………...Easter 2011 A.I. duPont Hospital Wilmington, DE. The Pay It Forward program partnered with Anglers Feeding America by donating $300 worth of various supplies shipped to help the victims dealing with the devastation caused by tornados in Alabama in 2011. The items were delivered In May 2011 and were part of a tractor trailer full of supplies shipped to Alabama. The Billy Mock Foundation supported The Joy of Sox in a great way. 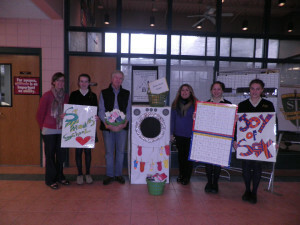 St. Thomas The Apostle School in Glen Mills, PA held a sock drive. The sock drive collected socks for homeless children. The Billy Mock Foundation then matched the number of socks the students collected. So it was really 2- for- 1 event! 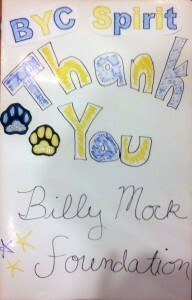 Thank you so much Billy Mock Foundation. There will now be twice as many warm toes this winter! For more information see the post on Joy of Sox website. Junior Board Bingo- The Billy Mock Foundation Pay it Forward program partnered with the Foundation’s Junior Board by supplying start up monies for the Junior Board’s yearly Bingo fundraiser. The 2011 Bingo night raised over $2,500.00. The proceeds were donated to a local family with a very sick child. Operation Courage – The Billy Mock Foundation collected and donated feminine hygiene products to be sent overseas. The Foundation had learned there was a great need for feminine hygiene products for the women soldiers that our serving our country. The Foundation partnered with Operation Courage to send these products to the many women soldiers that are presently serving. This great organization’s website is http://www.operationcourage.org/. BMF partnered once again in 2011& 2012, with a local college in assisting young children living in shelters with their families. 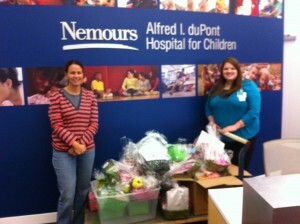 BMF provided funds to help those children purchase Mother’s Day gifts for their Moms.